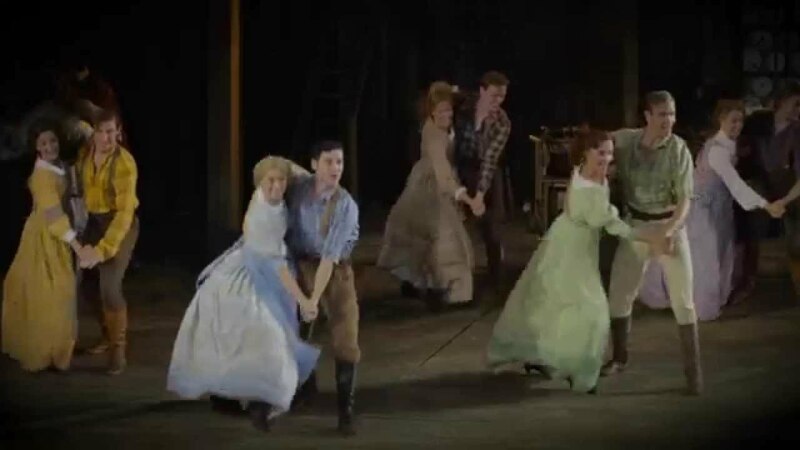 From the Golden Age of the movie musical, Seven Brides for Seven Brothers found its perfect partner in the Open Air Theatre. Laura Pitt-Pulford as Milly, director Rachel Kavanaugh reunited the creative team behind our award-winning production of The Sound of Music. Running time - Act 1: 1 hr 5 min, Interval 20 min, Act 2: 45 min. Originally Produced on Broadway by KASLAN PRODUCTIONS INC. In a marvellous performance, Laura Pitt-Pulford's sparky, indomitable Milly holds all the power. Rachel Kavanaugh's revival blossoms into an old-fashioned love story...I even found myself humming Bless Your Beautiful Hide all the way home." "The Open Air Theatre is so delightfully good at revivals of classic musicals that they have become a firm fixture on the summer cultural calendar. Seven Brides continues on this triumphant path...japes aplenty and, pleasingly, a score-full of beautiful songs. "With stunning, balletic choreography by Alistair David...there's spectacular axe-jumping, cartwheeling, trestle-table assembling, polka prancing, plank bashing and fist fighting. You have no choice but to give in, roll over, and look forward to summer." "Alistair David's choreography is ABSOLUTELY INCREDIBLE. The Brother's execusion...couldn't be more precise. As a unit they do not put a foot wrong and share unbreakably strong chemistry. Some of the tricks incorporated into the musical numbers stopped me in my tracks Leon Cooke (Daniel) in particular dazzles with phenomenal acrobatic ability." "Rachel Kavanaugh infuses this stage version with GENUIUNE CHARM and HIGH SPIRITS...while the songs have never sounded so BRIMMING WITH GOOD HUMOUR"
"Alistair David's BARNSTORMING CHOREOGRAPHY is packed with nimble charm, exuberance and athleticism...it's an exhilarating riot of swirling gingham and stomping boots, of wild polkas, square dances, cartwheels, backflips and fist fights. TERRIFIC FUN"
Rachel Kavanaugh's frolicking, rollicking, sunny and funny, appropriately barn-storming production bowls you over. Feel-good musical productions don’t some better than this. RESISTANCE IS FUTILE." To coincide with our production, Alex Gaumond, Laura Pitt-Pulford and Sam O’Rourke have recorded some tracks which appear on a new recording of songs from Seven Brides from Seven Brothers - a studio album released by JAY Productions with the National Symphony Orchestra. The CD is now available for £14 (including p+p).